The memoir of my father’s life is a short 70-page volume of text and photos. As well as recounting my father’s birth in Greece and his mature life in Canada, the book describes in detail my father’s profession as a candy maker and his great passions for hunting and fishing. I began writing it in late 2011 and self-published in 2013. I have given copies to many friends and family members. And my readers have written me to tell me how much they enjoyed the book and found it interesting and evocative. When Ellis Island records came online some years ago, my curiosity got the better of me and I went in search of my father. I had known for many years that my father entered Canada through Ellis Island, New York sometime in 1911 or 1912, when he was about 14 years old. With some difficulty I found him, and learned that he had landed at Ellis Island on November 16, 1911. As November 16, 2011 approached, I thought I should celebrate the 100th anniversary of my father’s arrival in North America by writing a short account (400 words) of his life. I did just this and posted it with some images on Facebook. Over 30 friends responded enthusiastically. But then I thought: this little story is incomplete. It covers just superficialities. My father’s life was so much more complex and interesting. But where do you start such a narrative? As you read my memoir of my father, the story progresses chronologically from his birth. But that is not how it was written. It grew organically. Yes, I did go back to the beginning and record how my grandmother died giving birth to my father, and how the young baby was sent to a monastery to be looked after by monks. But things didn’t develop in a straight line. As I thought of different parts of my father’s life, I wrote them out before I forgot them. Photographs played an important role. As I looked through our family pictures, I was reminded of episodes in Dad’s story: his life as a young man, his life with his family, and most importantly, his life as a candy maker and his love of the outdoors. My father had told me much about his early days. But I found out that he hadn’t always told me the truth. From my uncles, I learned that he had returned to Greece in 1921-22 but escaped to avoid being conscripted into the Greek army during the Greco-Turkish war (1920-1922); also Ellis Island records suggested he may have had a wife previous to my mother. I had to deal with all of this. There were two parts of my father’s life that had to be told in great detail. 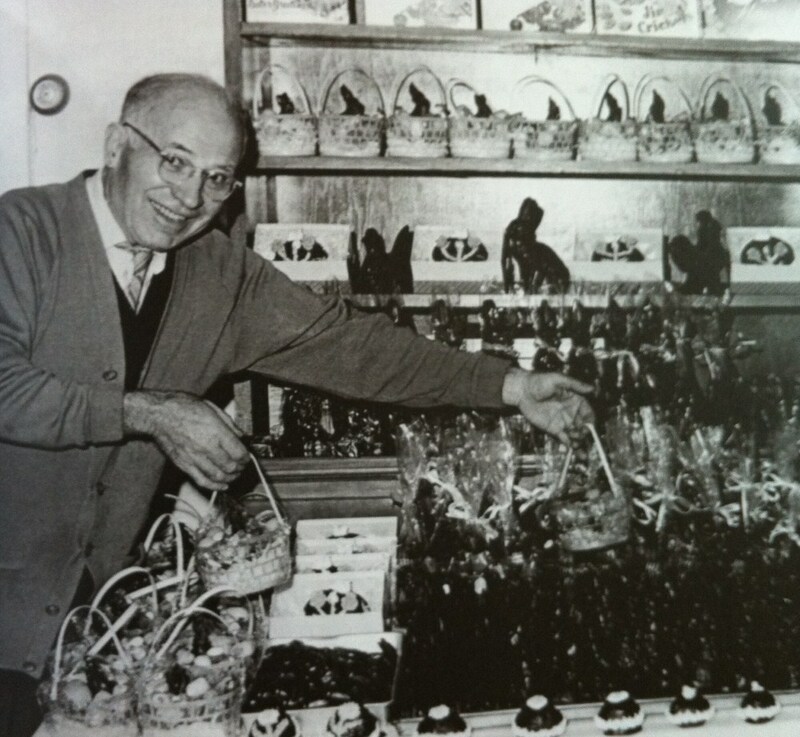 First, my father had been an old-fashioned candy maker and the story of his candies was the story of a lost art. I wrote a short chapter about this and positioned it chronologically. And, I couldn’t talk about my father without describing the pastimes he loved so much—hunting and fishing. As these pieces developed, I slotted them into a structure that was essentially linear. Chris Moskos in his candy shop. But two pieces proved especially problematic. As I said, I had a short chapter on my father as a candy maker. But I felt an obligation to describe the techniques and procedures in more detail. I expanded upon the craft of candy making in an appendix (including some recipes) for those who might want to know more about this vanished art form. My second problem was less easy to solve. My father was a complicated person. I now realize that he suffered from depression and that he was haunted by the 19th century hard work ethic of his family, especially his brothers. These aspects of my father’s personality made him sometimes a difficult person, especially in how he treated his family. The story called for a sensitively written chapter about our family life that I placed near the end of the book. It was the most difficult part of the story to tell. Fortunately, I was able to write a conciliatory resolution to the story that involved my three visits to Greece and my close friendship with my cousin who lives there. I’ve learned that writing the story of a family member is not simply listing the events in a timeline. It is more like arranging the pieces of a jigsaw puzzle. The pieces have to be found among a maze of scattered bits, and placed where they fit. Only then does the full picture emerge. If you are interested in reading my father’s memoir, please contact me at pmoskos(at)shaw(dot)ca. The price is $20 which covers the cost of printing. Peter Moskos is a retired editor and the current past chairperson of the BC branch of the Editors’ Association of Canada. You also did a wonderful job of capturing old-time candy-making methods. Fascinating stuff, not to mention mouthwatering. Well done, Peter. I remember your long and thorough searches through the Ellis Island records, and the mysteries you discovered and solved. The memoir of your father is a fascinating read. Very interesting piece, Peter. How you went about it makes perfect sense. I’ll bet you enjoyed the process!